Biography: Noah Isakov, currently working as a Professor in Cancer Immunobiology at the Shraga Segal Department of Microbiology, Immunology and Genetics, the Goldman Medical School, Ben Gurion University of the Negev, in Beer Sheva, Israel. He completed his Ph. D.in the Department of Cell Biology (immunology) at The Weizmann Institute of Science, Rehovot, Israel during the year 1976-1981. His major interest is in signal transduction mechanisms in normal and transformed cells, predominantly in the immune system. He was involved in the discovery and characterization of new signaling molecules in T lymphocytes and continues studying the intricate signaling pathways that regulate T lymphocyte functions and T lymphocyte-mediated immune responses. 1. Lymphocyte Activation and Signal Transduction. 2007. N. Isakov, (Ed), Transworld Research Network, Trivandrum, Kerala, India. 2. Regulation of immune system cell functions by protein kinase C. Frontiers in Immunology. 2012. Noah Isakov and Amnon Altman, Guest Editors. 1. Isakov, N., Segal, S., Hollander, N. and Feldman, M. 1978. An immuno-regulatory factor associated with spleen cells from tumor-bearing animals. I. Effect on tumor growth and antibody production. Int. J. Cancer 22: 465-470. 2. Hollander, N., Isakov, N., Segal, S. and Feldman, M. 1978. An immuno-regulatory factor associated with spleen cells from tumor-bearing animals. II. Characterization of the cell population involved in its production and release. Int. J. Cancer 22: 471-478. 3. Isakov, N., Segal, S. and Feldman, M. 1978. Immune surveillance and fetomaternal relationships: Suppression of immune functions by mouse amniotic fluid. In: 'Cell Biology and Immunology of Leukocyte Function', M.R. Quastel (ed), Academic Press, N.Y. pp 441-449. 4. Isakov, N., Hollander, N., Segal, S. and Feldman, M. 1979. An immuno-regulatory factor associated with spleen cells from tumor-bearing animals. III. Characterization of the factor's target cells. Int. J. Cancer 23: 410-414. 5. Isakov, N., Yankelevich, B., Segal, S. and Feldman, M. 1979. Differential immunogenic expression of an H-2 linked histocompatibility antigen on different tissues: Differences in survival between heart, thyroid and skin allografts. Transplantation 28: 31-35. 6. Isakov, N., Gorelik, E., Segal, S. and Feldman, M. 1980. Immunobiology of metastases. In: 'International Symposium on New Trends in Human Immunology and Cancer Immunotherapy', B. Serrous and C. Rosenfeld (eds), Doin Editeurs, Paris. pp. 671-681. 7. Isakov, N., Feldman, M. and Segal, S. 1982. Effect of an acute viral infection by a silent virus on the humoral immune responses. In: 'In vivo Immunology', Nieuwenhuis, Van den Broek and Hanna (eds), Plenum Publishing Corp., N.Y. pp. 455-460. 8. Isakov, N., Feldman, M. and Segal, S. 1981. Genetic regulation of metastasis progression: The development of pulmonary metastases of the 3LL lung carcinoma is controlled by both a non-H-2 gene(s) and a gene(s) linked to the H-2D region of the mouse MHC. Transplant. Proc. 13: 778-782. 9. Isakov, N. and Segal, S. 1981. The role of H-2 region encoded transplantation antigens in thyroid graft rejection: Possible tissue-associated polymorphysm of MHC-determined transplantation antigens. Transplant. Proc. 13: 963-968. 10. Isakov, N., Feldman, M. and Segal, S. 1981. Effect of lactic dehydrogenase virus infection on tumor induction and tumor growth. Cancer Res. 41: 667-672. 11. Isakov, N., Segal, S. and Feldman, M. 1981. H-2K region controlled products of the murine major histocompatibility complex differ in their immunogenic capacity when expressed on different tissues. Transplantation 32: 291-295. 12. Isakov, N., Feldman, M. and Segal, S. 1981. Control of progression of local tumor and pulmonary metastasis of the 3LL lung carcinoma by different histocompatibility requirements in mice. J. Natl. Cancer Inst. 66:919-926. 13 Isakov, N., Segal, S. and Feldman, M. 1981. The immunoregulatory characteristics of the lactic dehydrogenase virus (LDV), a common contaminant of tumors. Cell. Mol. Biol. 27:83-96. 14. Isakov, N., Feldman, M. and Segal, S. 1981. An immune response against the alloantigens of the 3LL Lewis lung carcinoma prevents the growth of lung metastases, but not of local allografts. Invas. Metas. 2: 12-32. 15. Isakov, N., Feldman, M. and Segal, S. 1982. Acute infection of mice with lactic dehydrogenase virus (LDV) impairs the antigen presenting capacity of their macrophages. Cell. Immunol. 66:317-332. 16. Isakov, N., Feldman, M. and Segal, S. 1982. The mechanism of modulation of humoral immune responses after infection of mice with lactic dehydrogenase virus. J. Immunol. 128: 969-975. 17. Isakov, N., Segal, S. and Feldman, M. 1982. Lactic dehydrogenase virus (LDV) impairs the antigen presentation capacity of macrophages but fails to affect their phagocytic activity. Immunobiology 162: 15-27. 18. Isakov, N., Katzav, S., De Baetselier, P., Tartakovsky, B., Feldman, M. and Segal, S. 1983. The immunogenetics of MHC controlled antigenic determinants on Lewis lung carcinoma (3LL) cells. In: 'Biochemical and Biological Markers of Neoplastic Transformation', P. Chandra (ed), Plenum Publishing Corp., N.Y. pp. 147-158. 19. Bach, F.H., Roopenian, D.C., Wee, S.L., Biel, L.W., Isakov, N. and Widmer, M.B. 1983. T cell responses to MHC and non-MHC antigens: Reexamining the LD-SD concept. In: 'Progress in Immunology', Y. Yamamura and T. Tada (eds), Academic Press, Inc., Japan. pp. 1449-1460. 20. Katzav, S., Tartakovsky, B., De Baetselier, P., Isakov, N., Feldman, M. and Segal, S. 1983. Role of MHC-encoded glycoproteins in tumor dissemination. Transplant. Proc. 15: 162-170. 21. Tartakovsky, B., De Baetselier, P., Isakov, N., Katzav, S., Feldman, M. and Segal, S. 1983. Class I MHC antigens of different subregions induce different IgG subclasses. J. Immunol. 130: 1017-1018. 22. Isakov, N. and Segal, S. 1983. A tumor-associated lactic dehydrogenase virus suppresses the host resistance to infection with Listeria monocytogenes, Immunobiology 164: 402-416. 23. Isakov, N., Katzav, S., Feldman, M. and Segal, S. 1983. Characterization of H-2 antigens on Lewis lung carcinoma relevant to its metastatic properties. J. Natl. Cancer Inst. 71: 139-145. 24. Isakov, N. and Bach, F.H. 1983 Thyroid graft rejection between C57BL/6 and H-2Kb mutant mice. Differences in the immunogenic expression of the mutated molecule on thyroids of six different mutants. Transplantation 36: 571-577. 25. Isakov, N. and Segal, S. 1983. Immunogenicity of the mutated H-2Kbm1 antigen(s). Test of thyroid graft rejection between B6-H-2Kbm1 and C57BL/6 mice following reciprocal immunization with normal versus malignant cells. Immunobiology 165: 485-499. 26. Isakov, N. and Bach, F.H. 1984. High frequency of splenic anti-class I cytotoxic T lymphocyte precursors correlates with in vivo rejection of K/D region disparate thyroid and islet grafts in mice. J. Immunol. 132: 50-56. 27. Isakov, N. and Bach, F.H. 1984. Unidirectional thyroid graft rejection between B10.S and B10.S(7R) mouse strains. Transplantation 37: 269-276. 28. Isakov, N., Feldman, M. and Segal, S. 1984. Loss of the H-2.33 private specificity by 3LL tumor cells correlates with the tumor potential to metastasize across H-2K region genetic barriers. Exp. Clin. Immunogenet. 1:170-174. 29. Isakov, N. and Bach, F.H. 1985. Genetic control of variability in responses to class I disparate thyroid grafts. Transplantation 39: 303-309. 30. Isakov, N. and Bach, F.H. 1985. Participation of class II alloantigens in in vitro regulation of K/D region disparate thyroid graft rejection in mice. J. Immunol. 134: 3580-3585. 31. Isakov, N., Fox, R.I., Dixon, F.J., Theofilopoulos, A.N. and Altman, A. 1985. Staining and fluorescence-activated cell sorter analysis of human lymphocytes using antibodies to a short, chemically-synthesized human IL-2 peptide. Cell. Immunol. 94: 491-499. 32. Isakov, N., Bleackley, R.C., Shaw, J. and Altman, A. 1985. The tumor promoter teleocidin induces IL-2 receptor expression and IL-2-independent proliferation of human peripheral blood T cells. J. Immunol. 135: 2343-2350. 33. Isakov, N., Bleackley, R.C., Shaw, J. and Altman, A. 1985. Teleocidin and phorbol ester tumor promoters exert similar mitogenic effects on human lymphocytes. Biochem. Biophys. Res. Commun. 130: 724-731. 34. Isakov, N. and Altman, A. 1985. Tumor promoters in conjunction with calcium ionophores mimic antigenic stimulation by reactivation of alloantigen-primed T lymphocytes. J. Immunol. 135: 3674-3680. 35. Altman, A., Cardenas, J.M., Houghten, R.A., Isakov, N., Dixon, F.J. and Theofilopoulos, A.N. 1985. Antibodies to human interleukin 2 induced by synthetic peptides. Cancer Treat. Symp. 1: 45-51. 36. Altman, A., Cardenas, J., Isakov, N., Balderas, R., Dixon, F.J. and Theofilopoulos A.N. 1985. Antibodies of predetermined specificity against chemically-synthesized peptides of human interleukin 2. In: 'Cellular and Molecular Biology of Lymphokines', G. Sorg and A. Schimpl (eds), Academic Press, N.Y. pp. 127-132. 37. Isakov, N., Biel, L.W. and Bach, F.H. 1985. Induction of class I antigen-disparate pancreatic islet graft rejection by in vivo administration of helper cell-independent cytolytic T lymphocytes. Transplant. Proc. 17: 727-728. 38. Biel, L.W., Morrow, C.E., Zhu, X.Y., Sutherland, D.E.R., Widmer, M.B., Isakov, N. and Bach, F.H. 1985. Ability of donor-sensitized bulk or cloned T lymphocytes to induce rejection of established pancreatic islet allografts. Transplant. Proc. 17: 826-827. 39. Isakov, N. and Altman, A. 1986. Lymphocyte activation and immune regulation. Immunol. Today 7: 155-157. 40. Isakov, N. and Altman, A. 1986. Interleukin 2, an immunoregulatory hormone: Biology and clinical implications. Clin. Immunol. Newslett. 7: 1-4. 41. Isakov, N., Scholz, W. and Altman, A. 1986. Signal transduction and intracellular events in T lymphocyte activation. Immunol. Today 7: 271-277. 42. Noonan, D.J., Isakov, N., Theofilopoulos, A.N., Dixon, F.J. and Altman, A. 1987. Protein kinase C activating phorbol esters augment expression of T cell receptor genes. Eur. J. Immunol. 17: 803-807. 43. Isakov, N. and Altman, A. 1987. Human T lymphocyte activation by tumor promoters: Role of protein kinase C. J. Immunol. 138: 3100-3107. 44. Ron, Y., Isakov, N. and Sprent, J. 1987. Unresponsiveness of MRL/MP-lpr/lpr mice to antigen given subcutaneously in adjuvant: Partial restoration of responses after local injection of B cells. J. Immunol. 139: 400-405. 45. Isakov, N., Scholz, W. and Altman, A. 1987. Effect of cyclosporin A on early stages of T cell activation. Transplant. Proc. 19: 1186-1190. 46. Isakov, N., Scholz, W., Mally, M. and Altman, A. 1987. T lymphocyte activation: The role of protein kinase C and the bifurcating signal transduction pathway. Immunol. Rev. 95: 89-111. 47. Isakov, N. 1988. Cell activation and signal initiation. Immunol. Today. 9: 251-252. 48. Scholz, W., Isakov, N., Mally, M.I., Theofilopoulos, A.N. and Altman, A. 1988. lpr-T cell hyporesponsiveness to mitogens linked to a defect in receptor-stimulated phosphoinositide hydrolysis. J. Biol. Chem. 263: 3626-3631. 49. Isakov, N. 1988. Regulation of protein kinase C activity by vitamin A derivatives. Cell. Immunol. 115: 288-298. 50. Isakov, N. and Morrow, P.R. 1989. Interleukin 2 regulates antigen-specific immunoglobulin response of naive B cells. Cell. Immunol. 120: 366-374. 51. Isakov, N., McMahon, P. and Altman, A. 1990. Selective post-translational down-regulation of protein kinase C isoenzymes in leukemic T cells chronically treated with phorbol ester. J. Biol. Chem. 265: 2091-2097. 52. Mustelin. T., Coggeshall, K.M., Isakov, N. and Altman, A. 1990. T cell antigen receptor-mediated activation of phospholipase C requires tyrosine phosphorylation. Science 247: 1584-1587. 53. Isakov, N., Gopas, J., Priel, E., Segal, S. and Altman, A. 1991. Effect of PKC-activating tumor promoters on metastases formation by fibrosarcoma cells. Invas. Metas. 11: 14-24. 54. Tamir, A. and Isakov, N. 1991. Increased intracellular cyclic AMP levels block PKC-mediated T cell activation by inhibition of c-jun transcription. Immunol. Letters 27: 95-100. 55. Altman, A., Mally, M. and Isakov, N. 1992. Phorbol ester synergizes with Ca2+ ionophore in activation of protein kinase C (PKC)a and PKCb isoenzymes in human T cells and in induction of related cellular functions. Immunology 76: 465-471. 56. Isakov, N., Mally, M. and Altman, A. 1992. Mitogen-induced human T cell proliferation is associated with increased expression of selected PKC genes. Mol. Immunol. 29: 927-933. 57. Gopas, J., Itzhaky, D., Segev, Y., Salzberg, S., Trink, B., Isakov, N. and Rager-Zisman, B. 1992. Persistent measles virus infection enhances major histocompatibility complex class I expression and immunogenicity of murine neuroblastoma cells. Cancer Immunol. Immunother. 34: 313-320. 58. Gopas, J., Ehrlich, T., Cohen, O., Wishniak, O., Rager-Zisman, B., Tainsky, M.A., Segal, S. and Isakov, N. 1992. H-ras oncogene regulates expression of 70- and 45-kDa cell surface molecules whose expression correlates with tumor cell immunogenicity. Int. J. Cancer 52: 329-335. 59. Isakov, N. 1992. T cell anergy and apoptosis in AIDS: Mechanisms of impairment of signal transduction processes by the human immunodeficiency virus. Adv. Allergy Immunol. 1:99-111. 60. Baier, G., Telford, D., Giampa, L., Coggeshall, K.M., Baier-Bitterlich, G., Isakov, N. and Altman, A. 1993. Molecular cloning and characterization of PKCq, a novel member of the protein kinase C (PKC) gene family expressed predominantly in hematopoietic cells. J. Biol. Chem. 268: 4997-5004. 61. Isakov, N. 1993. Tyrosine phosphorylation and dephosphorylation in T cell activation. Mol. Immunol. 30: 197-210. 62. Isakov, N., Galron, D., Mustelin, T., Pettit G.R. and Altman, A. 1993. Inhibition of phorbol ester-induced T cell proliferation by bryostatins is associated with rapid degradation of protein kinase C. J. Immunol. 150: 1195-1204. 63. Gueron, E., Isakov, N. and El-On, J. 1993. Leishmania major: Respiratory burst response of infected murine macrophages treated with paromomycin. Exp. Parazitol. 76: 371-376. 64. Isakov, N. 1993. Activation of murine lymphocytes by exogenous phosphatidylethanol-amine- and phosphatidylcholine-specific phospholipase C. Cell. Immunol. 152: 72-81. 65. Ehrlich, T., Wishniak, O., Cohen, O., Segal, S., Isakov, N., Rager-Zisman, B. and Gopas, J. 1994. The effect of H-ras expression on tumorigenicity and immunogenicity of Balb/c 3T3 fibroblasts. Immunol. Lett. 39: 3-8. 66. Segev, Y., Rager-Zisman, B., Isakov, N., Schneider-Schaulies, S., ter-Meulen, V., Segal, S., Udem, S. and Wolfson, M. 1994. Reversal of measles virus mediated increase of phosphorylating activity in persistently infected mouse neuroblastoma cells by anti-measles antibodies. J. Gen. Virol. 75: 819-827. 67. Galron, D., Tamir, A., Gelkop, S., Meller, N., Grossman, N. and Isakov, N. 1994. The effect of bryostatin on PKC regulated functions in human T lymphocytes and epidermal cells. Immunol. Lett. 39: 17-22. 68. Isakov, N., Tamir, A. and El-On, J. 1994. Supperssion of antigen-specific responses by leishmania major excreted factor: Inhibition of activation signals linked to the T cell antigen receptor and interleukin 2 receptor. Israel J. Med. Sci. 30: 673-679. 69. Tamir, A. and Isakov, N. 1994. Cyclic AMP inhibits phosphatidylinositol-coupled and -uncoupled mitogenic signals in T lymphocytes. Evidence that cAMP alters PKC-induced transcription regulation of members of the jun and fos family of genes. J. Immunol. 152: 3391-3399. 70. Galron, D., Tamir, A., Altman, A. and Isakov, N. 1994. Inhibition of PMA-induced human T cell proliferation by bryostatin is associated with enhanced degradation of conventional protein kinase C (cPKC): Ca2+ signals restore mitogenic activity without abrogating enhanced cPKC degradation. Cell. Immunol. 158: 195-207. 71. Baier, G., Baier-Bitterlich, G., Meller, N., Coggeshall, K.M., Giampa, L., Telford, D., Isakov, N. and Altman, A. 1994. Expression and biochemical characterization of human protein kinase C q. Eur. J. Biochem. 225: 195-203. 72. Isakov, N., Wange, R.L. and Samelson, L.E. 1994. The role of tyrosine kinases and phosphotyrosine-containing recognition motifs in regulation of the T cell-antigen receptor-mediated signal transduction pathway. J. Leuk. Biol. 55: 265-271. 73. Isakov, N., Wange, R.L., Burgess, W.H., Watts, J.D., Aebersold, R. and Samelson, L.E. 1995. ZAP-70 binding specificity to T cell receptor tyrosine-based activation motifs: the tandem SH2 domains of ZAP-70 bind distinct tyrosine-based activation motifs with varying affinities. J. Exp. Med. 181: 375-380. 74. Wange, R.L., Isakov, N., Burke, T.R., Otaka, A., Roller, P.P., Watts, J.D., Aebersold, R. and Samelson, L.E. 1995. F2 (Pmp)2-TAMz3, a novel competitive inhibitor of the binding of ZAP-70 to the T cell antigen receptor, blocks early T cell signaling. J. Biol. Chem. 270: 944-948. 75. Segev, Y., Ofir, R., Salzberg, S., Heller A., Weinstein, Y., Isakov, N., Udem, S., Wolfson, M. and Rager-Zisman, B. 1995. Tyrosine phosphorylation of measles virus nucleocapsid protein in persistently infected neuroblastoma cells. J. Virol. 69: 2480-2485. 76. Madrenas, J., Wange, R.L., Wang, J.L., Isakov, N., Samelson, L.E. and Germain, R.N. 1995. z phosphorylation without ZAP-70 activation induced by T cell receptor antagonists or partial antagonists. Science 267: 515-518. 77. Douvdevani, A., Abramson, O., Tamir, A., Konforty, A., Isakov, N. and Chaimovitz, C. 1995. Commercial peritoneal dialysis solution inhibits TNFa mRNA expression and NF-kB DNA-binding activity in LPS stimulated macrophages. Kidney Int. 47: 1537-1545. 78. Gelkop, S., Priel, E. and Isakov, N. 1995. T cell mitogens induce increased DNA topoisomerase I protein levels and its translocation to the nucleus where activation of the enzyme occurs. Biochem. Biophys. Res. Commun. 211: 872-877. 79. Wange, R.L., Guitian, R., Isakov, N., Watts, J.D., Aebersold, R. and Samelson, L.E. 1995. Activating and inhibitory mutations in adjacent tyrosines in the kinase domain of ZAP-70. J. Biol. Chem. 270: 18730-18733. 80. Erdel, M., Baier-Bitterlich, G., Duba, C., Isakov, N. Altman, A., Utermann, G. and Baier, G. 1995. Mapping of the human protein kinase C q gene locus to the short arm of chromosome 10 (10p15) by FISH. Genomics 25: 595-597. 81. Samelson, L.E., Donovan, J.A., Isakov, N., Ota, Y. and Wange, R.L. 1995. Signal transduction mediated by the T cell antigen receptor. Ann. N.Y. Acad. Sci. 766: 157-172. 82. Isakov, N., Wange, R.L., Watts, J.D., Aebersold, R. and Samelson, L.E. 1996. Purification and characterization of human ZAP-70 from a baculovirus expression system. J. Biol. Chem. 271: 15753-15761. 83. Tamir, A., Granot, Y. and Isakov, N. 1996. Inhibition of T lymphocyte activation by cAMP is associated with downregulation of two parallel mitogen-activated protein kinase pathways, the extracellular signal-regulated kinase and c-Jun N-terminal kinase. J. Immunol. 157: 1514-1522. 84. Meller, N., Liu, Y.-C., Collins, T.L., Bonnefoy-Berard, N., Baier, G., Isakov, N. and Altman, A. 1996. Direct interaction between PKCq and 14.3.3t results in inhibition of PKCq translocation and function in T cells. Mol. Cell Biol. 16: 5782-5791. 85. Isakov, N. 1996. Nobel awards to immunology pioneers who unraveled the mechanism of recognition of virus infected cells by killer T lymphocytes. Israel J. Obstet. Gynecol. 7: 211-214. 86. Isakov, N. 1997. Immunoreceptor tyrosine-based activation motif (ITAM), a unique module linking antigen and Fc receptors to their signaling cascades J. Leuk. Biol. 61: 6-16. 87. Isakov, N. 1997. ITIMs and ITAMs: The Yin and Yang of antigen and Fc receptor-linked signaling machinery. Immunol. Res. 16: 85-100. 89. Galron, D., Ansotegui, I.J. and Isakov, N. 1997. Posttranslational regulation of Lck and a p36-38 protein by activators of protein kinase C: Differential effects of the tumor promoter, PMA, and the non-tumor-promoter, bryostatin. Cell. Immunol. 178: 141-151. 90. Bazarsky, E., Galron, D., Wolfson, M., Granot, Y., Isakov, N. and Rager-Zisman, B. 1997. Persistent measles virus infection of murine neuroblastoma cells differentially affects the expression of PKC individual isoenzymes. Virus Genes 15: 227-234. 91. Isakov, N. 1998. The role of immunoreceptor tyrosine-based activation motif (ITAM) in signal transduction from antigen and Fc receptors. Adv. Immunol. 69: 183-247. 92. Isakov, N. 1998. ITAMs: Immunoregulatory scaffolds that link immunoreceptors to their intracellular signaling pathways. Receptors & Channels 5: 243-253. 93. Meller, N., Altman, A. and Isakov, N. 1998 New perspectives on PKCq, a member of the novel subfamily of protein kinase C. Stem Cells 16: 178-192. 94. Gelkop, S. and Isakov, N. Identification and characterization of Crk-binding proteins in activated T lymphocytes. 1999 In: Proceedings of the10th International Conference of Immunology, Talwar, G.P., Nath, I., Ganguly, N.K. and Rao, K.V.S. (Eds), Monduzzi Editore, Bologna, Italy, p. 1537-1543. 95. Meller, N., Elitzur, Y. and Isakov, N. 1999 Protein kinase C-q (PKCq) distribution analysis in hematopoietic cells. Proliferating T cells exhibit high proportions of PKCq in the particulate fraction. Cell. Immunol. 193:185-193. 96. Gelkop, S. and Isakov, N. 1999. T cell activation stimulates the association of tyrosine phosphorylated and enzymatically active ZAP-70 with the Crk adapter proteins. J. Biol. Chem. 274:21519-21527. 97. Isakov, N. 1999. Biotoon: ITAM sequences link activating immunoreceptors on the surface of various lymphoid cells to their corresponding intracellular signaling machinery. Graft 2:216-217. 98. Witte, S., Villalba, M., Bi, K., Liu, Y., Isakov, N. and Altman, A. 2000. Inhibition of the c-Jun N-terminal kinase/AP-1 and NF-?B pathways by PICOT, a novel protein kinase C-interacting protein with a thioredoxin-homology domain. J. Biol. Chem. 275:1902-1909. 99. Babichev, Y., Gelkop, S., Witte, S., Altman, A. and Isakov, N. 2000. The protein kinase C (PKC) q-interacting protein, PICOT, undergoes tyrosine phosphorylation in response to hydrogen peroxide. In: Proceedings of the 2nd Congress of the Federation of Immunological Societies of Asia-Oceania (FIMSA 2000), Sirisinha, S., Chaiyaroj, S.C. and Tapchaisri, P. (Eds), Monduzzi Editore, Bologna, Italy, pp. 11-16. 100. Gelkop, S. and Isakov, N. 2000. Crk adaptor proteins interact with the ZAP-70 protein tyrosine kinase in a T cell activation dependent manner. In: Proceedings of the 2nd Congress of the Federation of Immunological Societies of Asia-Oceania (FIMSA 2000), Sirisinha, S., Chaiyaroj, S.C. and Tapchaisri, P. (Eds), Monduzzi Editore, Bologna, Italy, pp. 33-38. 101. Isakov, N. and Biesinger, B. 2000. Lck protein tyrosine kinase is a key regulator of T-cell activation and a target for signal intervention by Herpesvirus saimiri and other viral gene products. Eur. J. Biochem. 267:3413-3421. 102. Altman, A. Isakov, N. and Baier, G. 2000. Protein kinase C-q: a new essential superstar on the T cell stage. Immunol. Today. 21:567-573. 103. Isakov, N., Witte, S. and Altman, A. 2000. PICOT-HD: a highly conserved protein domain that is often associated with thioredoxin and glutaredoxin modules. Trends Biochem. Sci. 25:537-539. 104. Babichev, Y., Meller, N., Gelkop, S., Yiflah-Vishkerman, V., Witte, S., Altman, A. and Isakov, N. 2000. Identification and characterization of PKC-q interacting proteins. Curr. Top. Biochem. Res. 3:243-250. 105. Gelkop, S., Babichev, Y. and Isakov, N. 2001. T cell activation induces direct binding of the Crk adapter protein to the regulatory subunit of phosphatidylinositol 3-kinase (p85) via a complex mechanism involving the Cbl protein. J. Biol. Chem. 276:36174-36182. 106. Babichev, Y., Witte, S., Altman, A. and Isakov, N. 2001. The human PICOT protein possesses a thioredoxin-like homology domain and a tandem repeat of a novel domain which is highly conserved during evolution. In: ‘Protein Modules in Cellular Signalling’, Heilmeyer, L., Jr. and Friedrich, P. (Eds), IOS Press OHM, Amsterdam, Berlin, Oxford, Tokyo Washington, DC, Series A: Life Sciences - Vol. 318, pp. 104-113. 107. Babichev, Y. and Isakov, N. 2001. Tyrosine phosphorylation of PICOT and its translocation to the nucleus in response of human T cells to oxidative stress. Adv. Exp. Med. Biol. 495:41-45. 108. Isakov N. and Altman, A. 2002. Protein kinase C–q in T cell activation. Ann. Rev. Immunol. 20:761-794. 109. Gelkop, S., Babichev, Y., Kalifa, R., Tamir, A. and Isakov, N. 2003. Involvement of the Crk adaptor proteins in the regulation of lymphoid cell functions. Immunol. Res. 28:79-91. 110. Ohana-Malka, O., Benharroch, D., Isakov, N., Prinsloo, I., Shubinsky, G., Sacks, M. and Gopas, J. 2003. Selectins and anti-CD15 (Lewis X/A) antibodies transmit activation signals in Hodgkin’s lymphoma derived cell lines. Exp. Hem. 31:1057-1065. 111. Gelkop, S. Gish, J., Babichev, Y. and Isakov, N. 2004. T cell activation induces a mutually exclusive interaction between ZAP-70 and CrkII or Vav. Immunology 2004. Proceedings of the 12th International Congress of Immunology and 4th Annual Conference of FOCIS, Medimond International Proceedings, 2004, pp 169-172. 112. Babichev, Y., Tamir, A., Park, M., Muallem, S. and Isakov, N. 2005. Cloning, expression and functional characterization of the putative regeneration and tolerance factor (RTF/TJ6) as a functional vacuolar ATPase proton pump regulatory subunit with a conserved sequence of immunoreceptor tyrosine-based activation motif. Int. Immunol. 17:1303-1313. 113. Gelkop, S. Gish, J., Babichev, Y., Pawson, T. and Isakov, N. 2005. T cell activation-induced CrkII binding to the ZAP-70 protein tyrosine kinase is mediated by Lck-dependent phosphorylation of ZAP-70 tyrosine 315. J. Immunol. 175:8123-8132. 114. Isakov, N. 2006. Shraga Segal (1939-2006) - Obituary. In Archivum Immunologiae et Therapiae Experimentalis. 54:297-298. 115. Ohayon, A., Dong, G. and Isakov, N. 2007. Involvement of PKCq in CD4+ T cell polarization and mouse resistance to cutaneous Leishmaniasis. In: ‘Lymphocyte Activation and Signal Transduction’. 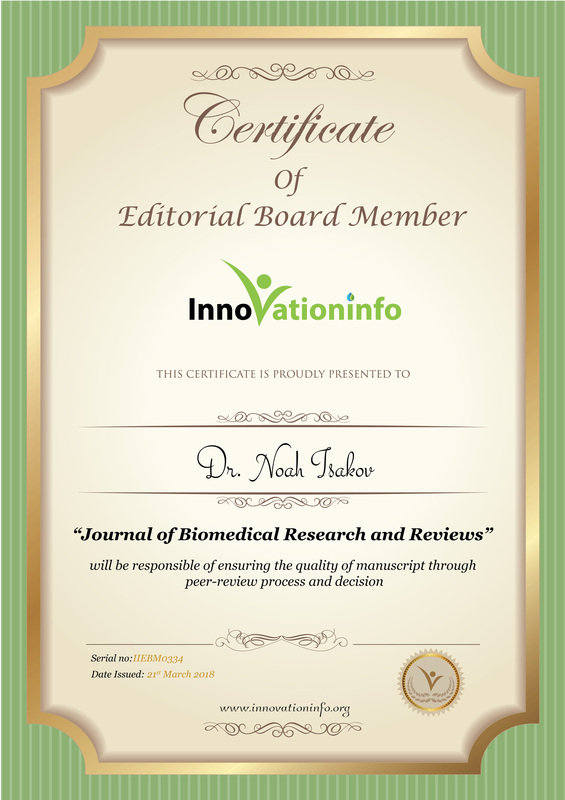 N. Isakov, (Ed), Transworld Research Network, Trivandrum, Kerala, India, pp. 221-238. 116. Isakov, N. 2008. A new twist to adaptor proteins contributes to lymphocyte cell signaling regulation. Trends Immunol. 29:388-396. 117. Glanz, A., Albrecht, J.-C., Heinemann, S., Fleckenstein, B., Isakov, N. and Biesinger, B. 2008. NF-kB activation by the viral oncoprotein StpC enhances IFNg production in T cells. Immunol. Cell Biol. 86:622–630. 118. Ohayon, A., Dong, G., Cohen, S., Galperin, M., Givoni, A., Moyal, K. and Isakov, N. 2008. PICOT: A Trx- and Grx-like protein in search of a function. The Open Enzyme Inhibition Journal. 1:48-51. 119. Cohen, S., Braiman, A., Shubinsky, G., Ohayon, A., Altman, A. and Isakov, N. 2009. PKCq is required for hemostasis and positive regulation of thrombin-induced platelet aggregation and a-granule secretion. Biochem. Biophys. Res Commun. 385:22-27. 120. Ohayon, A., Babichev, Y., Pasvolsky, R., Dong, G., Sztarkier, I., Benharroch, D., Altman, A. and Isakov, N. 2010. Hodgkin’s lymphoma cells exhibit high expression levels of the PICOT protein. J. Immunotoxicol. 7:8-14. 121. Ohayon, A., Babichev, Y., Galperin, M., Altman, A. and Isakov, N. 2010. Widespread Expression of PICOT in Mouse and Human Tissues with Predominant Localization to Epithelium. 2010. J. Histochem. Cytochem. 58:799-806. 122. Ohayon, A., Golenser, J., Sinay, R., Tamir, A., Altman, A., Pollack, Y. and Isakov, N. 2010. PKCθ deficiency increases resistance of C57BL/6J mice to Plasmodium berghei infection-induced cerebral malaria. Infect. Immunity 78:4195-4205. 123. Kong, K-F., Yokosuka, T., Canonigo-Balancio, A. J., Isakov, N., Saito, T. and Altman, A. 2011. A novel motif in the V3 domain of protein kinase C-θ (PKCθ) determines its immunological synapse localization and functions in T cells via association with CD28. Nat. Immunol. 12:1105-1112. 124. Cohen, S., Braiman, A., Shubinsky, G. and Isakov, N. 2011. Protein kinase C-theta in platelet activation. FEBS Lett. 585:3208-3215. 125. Keselman, A., Pulak, R.N., Moyal, K. and Isakov, N. 2011. PICOT: a multidomain protein with multiple functions. ISRN Immunol. Vol. 2011, Article ID 426095. 126. Gelkop, S., Weisman, B., Pulak, R.N., Zharhary, D. and Isakov, N. 2012. Development of unique antibodies directed against each of the six different phosphotyrosine residues within the T cell receptor CD3z chain. J. Immunol. Methods. 375:129-37. 127. Isakov, N. 2011. Differential requirements for protein kinase C-theta at the immunological synapse of effector versus regulatory T cells and thdoi:10.4172/2155-9899.1000e104. 128. Isakov, N. 2012. ZAP70-related SCID: Non-redundant dual functions of the ZAP70 catalytic and scaffolding regions. J. Clin. Case Reports. 2:e113. 129. Isakov, N. and Altman, A. 2012. PKC-theta-mediated signal delivery from the TCR/CD28 surface receptors. Front. Immunol. 3:273. 130. Isakov, N. 2012. PKCθ is a key regulator of T-cell behavior and a drug target for T cell-mediated diseases. J. Clin. Cell. Immunol. S12:1-7. 131. Isakov, N. Signal Transduction Mechanisms in T lymphocytes - Introduction. 2013. J. Clin. Cell. Immunol. S12: e001. 132. Isakov, N. Cell transplantation therapy using pluripotent stem cells. 2013. World J. Immunol. 3:15-17. 133. Isakov, N. and Altman, A. 2013. Regulation of immune system cell functions by protein kinase C. Front. Immunol. 4:384. 134. Isakov, N. 2013. Insight into disease processes through studies of the intracellular vesicle transport system. J. Clin. Case Rep. 4: e125. 135. Nath, P. R. and Isakov, N. 2014. Regulation of immune cell functions by Pin1. Intl. Trends Immun. 2:22-28. 136. Sharon, G., Leibowitz, M. P., Chettri, J. K., Isakov, N. and Zilberg, D. 2014. Comparative study of infection with Tetrahymena of different ornamental fish species. J. Comp. Pathol. 150:316-324. 137. Etzion, Y., Ozer, J., Ishay, Y., Sahar, G. and Isakov, N. 2014. PICOT as a dual regulator of cardiomyocyte hypertrophy and inotropy. J. Clin. Case Rep. 4: e1131. 138. Sal-Man, N. and Isakov, N. 2014. Pathogen hijacking of Crk adaptor proteins and Crk-regulated signal transduction pathways. Austin J. Clin. Immunol. 1:1-3. 139. Sharon, G., Nath, R. P., Isakov, N. and Zilberg, D. 2014. Evaluation of guppy (Poecilia reticulata Peters) immunization against Tetrahymena sp. by enzyme-linked immunosorbent assay (ELISA). Vet. Parasitol. 15:28-37. 140. Nath, R.P., Dong, G., Braiman, A. and Isakov, N. 2014. Immunophilins Control T Lymphocyte Adhesion and Migration by Regulating CrkII Binding to C3G. J. Immunol. 193:3966-3977. 141. Zurgil, U., Ben-Ari, A., Atias, K., Isakov, N., Apte, R. and Livneh, E. 2014. PKCη promotes senescence induced by oxidative stress and chemotherapy. Cell Death & Disease 5, e1531. 142. Nath, P. R. and Isakov, N. 2014. PKC-theta-regulated signaling in health and disease. Biochem. Soc. Trans. 42:1484-1489. 143. Isakov, N. 2014. Cell-penetrating peptides as modulators of cell signaling and potential therapeutics. Intl. Trends Immun. 2:138-142. 144. Sharon, G., Pimenta-Leibowitz, M., Vilchis, M. C. L., Isakov, N. and Zilberg, D. 2015. Controlled infection of Poecilia reticulata Peters (guppy) with Tetrahymena by immersion and intraperitoneal injection. J. Fish Dis. 38:67-74. 145. Nath, P. R. and Isakov, N. 2015. Insights into Peptidyl Prolyl cis-trans Isomerase Structure and function in Immunocytes. Immunol. Letters 163:120-131. 146. Braiman, A. and Isakov, N. 2015. The role of Crk adaptor proteins in T cell adhesion and migration. Front. Immunol. 6:509. 147. Isakov, N. 2015. CrkII-dependent T cell adhesion and migration is regulated by immunophilins. Intl. Trends Immun. 3:85-88. 148. Nath, R.P., Dong, G., Braiman, A. and Isakov, N. 2016. In vivo regulation of human CrkII by cyclophilin A and FK506-binding protein. Biochem. Biophys. Res. Commun. 470:411-416. 149. Isakov, N. 2016. Immune checkpoint-targeted therapy: cancer and autoimmune diseases represent two sides of the same coin. J. Autoimmune Dis. 2:1-4. 150. Isakov, N. 2016. DFTD: A contagious fatal cancer that threatens the Tasmanian devils. J. Clin. Cell. Immunol. 7:e118 (1-3). 151. Isakov, N. 2017. Current challenges for the anti-Devil facial tumor disease (DFTD) vaccine development. J. Vacc. Clin. Trials 1:1-3. 152. Dong, G., Kalifa, R., Nath, R.R., Babichev, Y., Gelkop, S., and Isakov, N. 2017. Crk adaptor proteins regulate CD3ζ chain phosphorylation and TCR/CD3 down-modulation in activated T cells. Cell. Signal. 36:117-126. 153. Isakov, N. 2017. Protein kinase C (PKC) isoforms in cancer, tumor promotion and tumor suppression. Sem. Cancer Biol. 154. Dong, G., Kalifa, R., Nath, R.R., Gelkop, S., and Isakov, N. 2017. TCR crosslinking promotes Crk adaptor protein binding to tyrosine-phosphorylated CD3ζ chain. Biochem. Biophys. Res. Commun. 8:541-546. 155. Isakov, N. 2017. Future perspectives for cancer therapy using the CRISPR genome editing technology. J. Clin. Cell. Immunol. 8:3:e120 (1-4). 156. Nayak, S., Koven, W., Meiri, M., Khozin-Goldberg, I., Isakov, N., Zibdeh, M. and Zilberg, D. 2017. Dietary arachidonic acid affects immune function and fatty acid composition in cultured rabbitfish Siganus rivulatus. Fish Shellfish Immunol. 68:46-53.